The St. Joseph Museum & Archives is maintained and operated by volunteer members of The St. Joseph Historical Society, St. Joseph, Ontario. We are society members of the Ontario Historical Society. educate the public on this history. Through membership dues, fundraising activities and donations, the unique history of St. Joseph, Ontario is preserved for the good of the community and presented to tourists, students, schools and historians. We hold monthly meetings to discuss projects that promote our mandate and to enjoy presentations on local history. We partner with the Huron Tourism Association and the Huron Arts & Heritage Network to promote heritage and culture along Ontario’s West Coast. This includes display setup at local events and the promotion of same to the local community through the media. We enjoy the support and involvement of many local groups, institutions and businesses in our events and meetings, such as the Royal Canadian Legions of Hensall, Grand Bend and Exeter, St. Peters’ Roman Catholic Church and the Bluewater Rest Home. We also share information with the Huron County Historical Society and the Ontario Historical Society. We’re always pleased to welcome new members. If you’re interested in finding out more about the St. Joseph Historical Society, either as a volunteer or supporting member, please contact us. 1999 — In partnership with the Millennium Bureau of Canada, created the St. Joseph Historical Park. The park displays a statue of St. Joseph holding Baby Jesus. Historical informational plaques tell St. Joseph’s history. Memorial plaque for Brother André. Walkway memorial and commemorative plaques of local families and supporters of the Historical Society. Veterans commemorative monument. 2002-2003 — Consolidated and housed the historical archives at Hessenland Country Inn to better preserve historical materials and offer increased access to the public. A Trillium grant enabled the organization and cataloguing of the archives. Provided materials and assistance to local playwright Paul Ciufo in his efforts to create a play about the St. Joseph local history. 2008-2009 — Provided expertise, artefacts and personnel to set up an historical display called “Innovative Huron” at the Huron County Museum in Goderich. Created and launched this website to further publicize the St. Joseph Museum and the activities of the Historical Society. Hosted and aided the Head Archivist and Editor-in-Chief from The St. Joseph’s Oratory of Mount Royal in Montreal in their process of compiling information about Blessed Brother André in the process towards sainthood. 2010 — Playwright Paul Ciufo and Director Duncan McGregor worked on the development of a historical play about St. Joseph and Narcisse Cantin. 2010 — Support for this website was received from the Huron Heritage Fund. 2011— The Historical Society presented “Narcisse“, an outdoor theatrical event July 19 to 23 and 26 to 30, 2011. 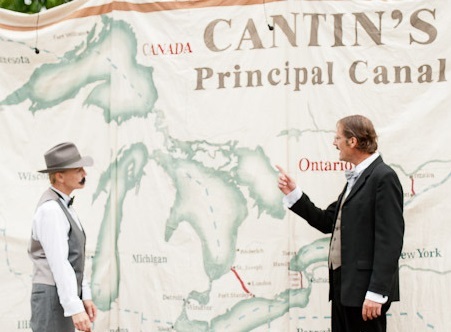 The play Narcisse tells the story of arguably one of Huron County’s most colourful residents – Narcisse Cantin – best known for his audacious plan to create a mammoth canal cutting across Southwestern Ontario, connecting Lake Huron to Lake Erie from St. Joseph to Port Stanley. Cantin turned St. Joseph into an early 20th Century boomtown on speculation of the canal’s construction. This charismatic promoter forged friendships with prominent people including American steel magnate Charles Schwab and recently-canonized Brother André, founding cleric of St. Joseph’s Oratory in Montréal. 2011—The inaugural Governor General’s History Awards for Excellence in Community Programming was awarded to The St. Joseph and Area Historical Society to recognize the initiatives of volunteer-led heritage, community and cultural organizations for their community theatre production entitled ‘Narcisse: The Father of the St. Lawrence Seaway’ The Historical Society received a cash prize as well as a medal and artistic plaque provided by Canada’s History Society. Joan Karstens and Pat Rowe were honoured to accept this award from the Governor General at Rideau Hall in Ottawa. Read the Canadian History Society Press Release. 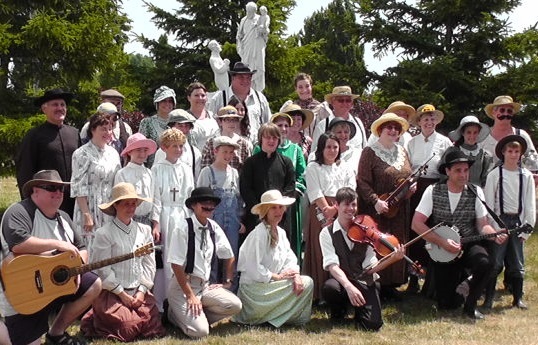 2012 – A dramatized Cemetery Tour ‘Grave Matters ‘ was held in historic St. Peter’s Catholic Church Cemetery in St. Joseph. 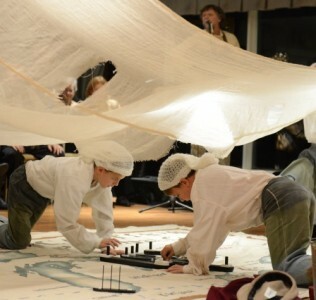 We caught a glimpse into the past as descendants of the French settlement families shared short stories of the joys, sorrows and struggles of the everyday life of their early ancestors. Historical displays in the church hall offered more of the background surrounding these founding families. Tours were led on Saturday & Sunday, July 21 & 22, running at 30-minute intervals from 1pm-4pm. 2013 – The Society developed and presented the historically and culturally relevant production, “White Hurricane”, at Hessenland Country Inn. The 1913 storm was a blizzard with Hurricane force winds. The play brought to life the decisions to risk one last voyage; the warnings; the lives of those lost; and, the impact on our community. The production was to run one weekend. It soon became apparent that 3 more nights and another weekend were needed. 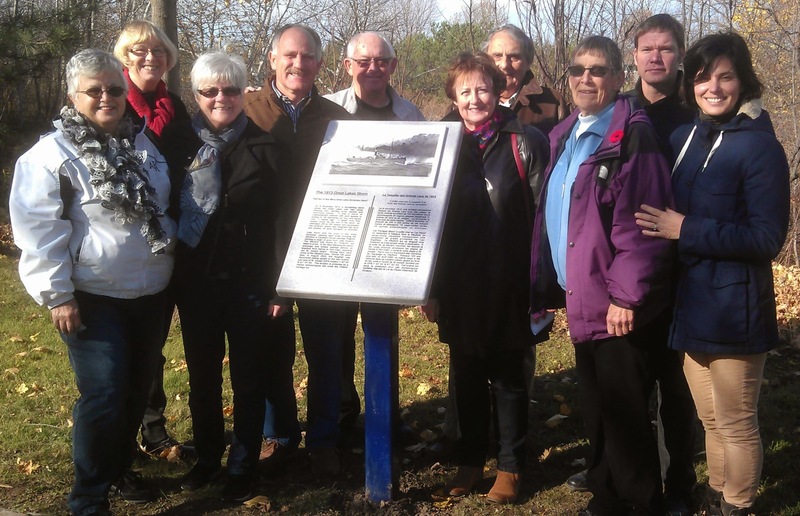 2014 – Wexford Plaque – Proceeds of the raffle at last year’s production of the “White Hurricane” and a generous grant from the Municipality of Bluewater allowed us to erect another historical plaque in St Joseph’s Memorial Park. The plaque faces the spot in the lake where the Wexford lies. 2014-2016 – The panels in the Archives were catalogued, photographed and put online. The park has a memorial monument to honor and recognize those men and women who have served our country. It was built by Tony LaPorte from beach stone and cement. Since 2010 the society has been hosting a Remembrance Service. Each year attendance has been growing to where we were getting between 75 and 100 people in attendance. To create a greater awareness and provide a higher profile of the monument funding was sought from the Veteran Affairs Canada, Cenotaph/Monument Restoration Program. With support from the Municipality, the Society, Lakewood Garden Centre, McCann Redi-Mix Inc and Murals in Metals the project was completed in time to be dedicated at the 2016 Breakfast in the park. Director – Joseph L. Wooden : author of A Drum To Beat Upon. Book available for purchase from this website. Much of this website’s content has relied upon Joseph Wooden’s historical research and materials.